Black Mountain Bushwalk. Another one of Canberra's awesome mountain hikes. Where: Black Mountain, telstra Tower. There are a number of tracks on Black Mountain which make excellent bushwalks. The one I did was the forest track and part of the summit trail to the Telstra tower. The forest track is about 60m below the summit and makes for an extremely scenic hike. The track loops around the 60m contour and provides spectacular views across Canberra. The vegetation differs as you make your way around the trail. This is due to the different aspects which provides different growing opportunities for plants. 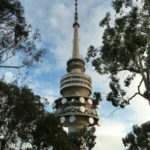 You have no doubt seen the Telstra Tower from many different parts of Canberra. The views from the forest track look down on the same places where you have peered up at that giant structure. While doing the forest track on Black mountain it is a must to go up the summit trail as well and get some pics of Telstra Tower. All up including going to the Black Mountain summit, the walk is around 5km. And like any summit walk it is fairly steep making your way to the top. Black mountain offers a number of different treks. I highly recommend this walk. It’s another awesome bushwalk in Canberra. Directions to Black Mountain Bushwalk. Google Map Link. As you drive up Black Mountain Drive on Black Mountain, there is a large carpark about 60m below the summit. Park here and the Forest Track is well sign posted. Black Mountain Bushwalk trail Map. Black Mountain Bushwalk Photo Gallery. Black Mountain Bushwalk Youtube Clip. Bushwalking Canberra, act bushwalks, Canberra bushwalks, tracks, trails, black mountain bushwalk.